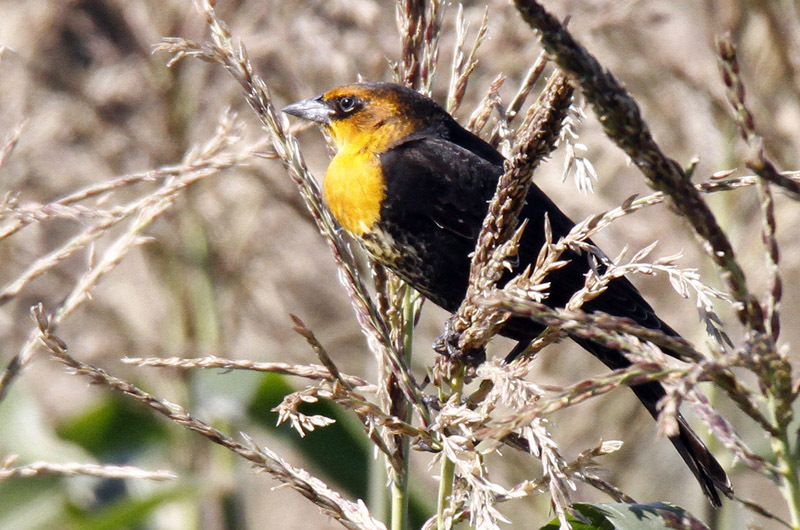 Blackbirds abound: yellow-headed blackbird was also spotted this week. Bob Shriber found a flock of four rusty blackbirds on Oct. 13 in a West Tisbury cornfield. They were foraging on the corn cobs that were scattered around on the ground. On Oct. 16, the trio of Lanny McDowell, Bob Shriber and Allan Keith went searching for them, and found one of them in the same cornfield. That same day, Saskia Vanderhoop spotted five of them in the aspen trees next to her house. This species used to be a common fall migrant in October, with the highest number ever reported being a flock of 500 of them on Oct. 16, 1970. Now they are quite rare, and are not observed every year. Nationally, their population has declined by an estimated 95 per cent in the past 40 years. 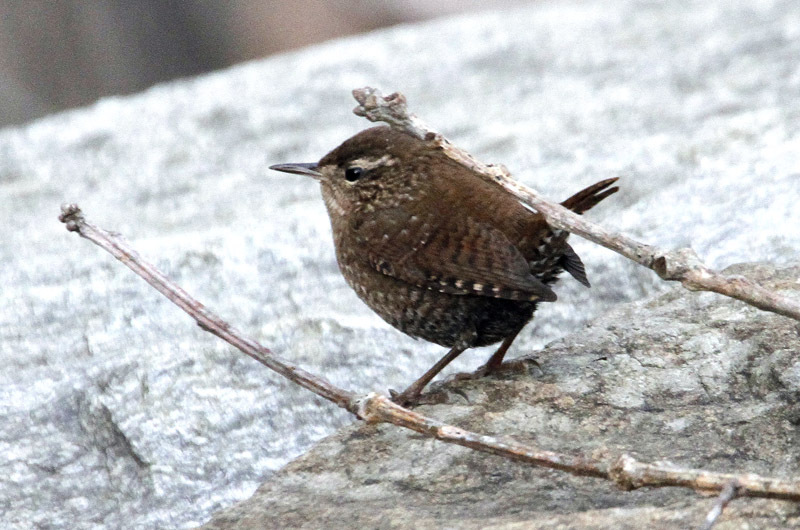 Needless to say, with that level of decline they are an uncommon resident of wooded swamps; breeding in the boreal forests of Canada and Alaska and spending their winters in the eastern United States. Scientists do not understand why rusty blackbirds have declined so much. There is an intensive effort to study them now, before they disappear completely. They are now at the peak of their southward migration, which continues for a couple more weeks. There have been a few sightings in eastern Massachusetts, mostly of four or fewer individuals. Most of these birds will be gone by the end of November, as we are on the very northern edge of their wintering range. The spring migration is another opportunity for us to study this disappearing species. Data from the last two springs shows that there were relatively few rusty blackbird sightings in southeastern Massachusetts, mostly of single individuals. Because of this paucity of sightings, we are not in a great location to study these rare blackbirds. The Midwest gets more and larger flocks, so the higher priority sites are out there. But we enjoy them when we see them. And we can hope that we will soon solve the riddle of why the rusty blackbird population has declined so sharply. What a week it was. There were sightings of unusual species, sightings of species that are arriving to spend the winter here and sightings of migrants passing through. Our most unexpected sighting of the week comes from Ellie Fitzgerald, who spotted a wet male western tanager at her Aquinnah feeder between two heavy rain showers on Oct. 13. This species is a rare transient on the Vineyard. As its name suggests, it is found almost exclusively in the western United States. There is one other record for this species in New England this fall, of a female or immature bird on Plum Island in northeastern Massachusetts between Sept. 19 and 23. While the bright yellow body, two wing bars and orange/red head make this bird’s identification fairly routine, it sure would be nice to have a photograph to confirm its presence. I have been told to photograph my unusual sightings many a time. Another interesting sighting this week is of a yellow-headed blackbird, which was found by the same trio that found the rusty blackbird mentioned above. Young male yellow-headed blackbirds are fairly unmistakable as they have a black body with a bright yellow head and chest in their breeding plumage. They are rare transients on the Vineyard. In the 1980s they could occasionally be found in the cattle pastures of Herring Creek Farm, but recent sightings have been in fields where corn is grown. We have a whole suite of species that are winter residents only. Several of them are in the news this week for the first sightings of the season. One of them is the snow bunting, which typically can be found in flocks on barrier beaches. Solitary snow buntings are somewhat unusual, but Luanne Johnson found one along the Sengekontacket Pond shoreline near Farm Neck on Oct 13. She is also the first to report one brant mixed in with a flock of at least 90 Canada geese in Ocean Park on Oct. 17. Brant are smaller cousins of Canada geese and a flock of them can be found in that park every winter. Lanny McDowell and Matt Pelikan visited Aquinnah on Oct. 15 and found three seasonal firsts: dark-eyed junco, winter wren and American pipit. On Oct. 17, I found the first golden-crowned kinglet of the season within a flock of chickadees. It was a nice sighting as it was low in the trees, affording me a good look at the seldom seen orangy-reddish patch in the middle of the golden crown atop its head. More typically, this species stays in evergreen treetops and only its undersides are observed. I also visited one of the Morning Glory Farm fields and found the first flock of field sparrows. Here it is most of the way through this week’s column, and I am finally getting to the sightings that are not seasonal firsts. It was a remarkable week. On Oct. 12, David P. B. Stephens observed a pine warbler on East Chop. Susan Straight found a brown creeper at her Chilmark house on Oct. 14. Also on that date, Luanne Johnson observed a rather late osprey in Sengekontacket Pond’s Major’s Cove. Mr. Pelikan and Mr. McDowell visited Aquinnah on Oct. 15, and, in addition to the birds reported above, found white-crowned sparrow, Lincoln’s sparrow, clay-colored sparrow, dickcissel, pine warbler, common yellowthroat, palm warbler, Nashville warbler, eastern meadowlark and eastern phoebe. Mr. Pelikan remarked that he saw more birds — albeit mostly robins and yellow-rumped warblers — than he has seen there in a long time. On Oct. 17, I visited one of my favorite warbler traps (a place where migrating songbirds often accumulate), the woodlands just east of Crackatuxet Cove in Edgartown. There were several phoebes and palm warblers, all wagging their tails, one yellow-rumped warbler and a few catbirds. Oct. 18 was a busy birding day. Nancy Weaver, Margaret Curtin and Greg Palermo visited the Gay Head Cliffs. They counted three peregrine falcons and one American kestrel. Matt Pelikan visited Katama and found a steady stream of yellow-rumped warblers arriving from over the ocean to the south, with hundreds more of them foraging in the shrubs along the Mattakessett Herring Creek. He also observed several northern harriers foraging nearby. Lanny McDowell found an indigo bunting and a bobolink near Beetlebung Corner. Kate Meleney spotted a ruby-crowned kinglet in her East Chop yard on Oct. 19. And Luanne Johnson observed a Baltimore oriole eating some dogwood berries in her yard. Photos of October bird sightings.